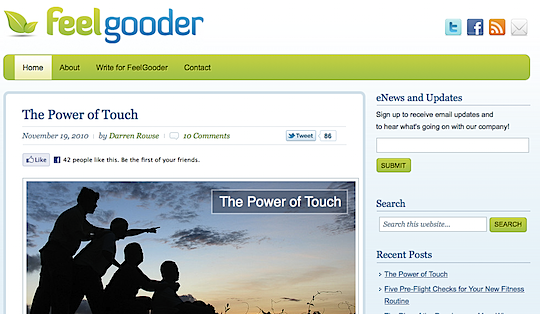 Earlier this week I launched a new blog: FeelGooder. This post will give some of the backstory behind it (expect another one next week with more). What? Another blog? Are you crazy? Two months ago I wrote about the process I’d gone through to hire Georgina Laidlaw to work on content development and strategy for me. One of the reasons I expanded my team in this way was to create for myself some head space to dream and develop new projects. You’ve already seen some of these rolled out (the Free Getting Started Blogging course (with over 5000 participants already) and the soon-to-be-released ProBlogger Academy). I can’t tell you how much I’ve enjoyed having a little extra head space over the last month to dream. It’s led to all kinds of ideas, collaborations, and opportunities (as well as a little more life balance). It’s been one of the best things I’ve done in the last few years of blogging. Another long-term goal that I’ve had is to run a blog on a much wider niche than my previous blogging endeavors. FeelGooder is that blog. Let me start by saying that what you see of FeelGooder today is very much a stage one of where I’m hoping it’ll go. I’ve described what we’ve done so far as a “soft launch” but perhaps a better description would be that it’s FeelGooder v0.1 (beta), and that my hope is for it to expand well beyond what you see on it today. As I describe in the Welcome to FeelGooder post a couple of days ago, the blog’s focus is pretty wide. In some ways it’s niche is Life (how much broader could you get?). It’s a bit of a departure from my previous blogs, which were quite focused (on topics like Blog Tips, Photography, and Twitter). I’m under no allusions that such a broad niche will be easy, but this is something I’ve always wanted to do—partly because it connects with where I’m at personally, partly because of my own values and passions, and partly … just to see if I can pull it off. The goal is to produce daily posts that are a mix of information (tips, guides, help), inspiration (stories, uplifting, and hope-filled articles), and interaction that will help people better experience the richness of their lives. Relationships: family, friendship, romance, etc. Social Good: sustainable living, generosity, and making the world a better place. In time, these topics will expand (and I would like to see some of them splinter off into more targeted topics, too). Another departure for me with FeelGooder is that I’m launching it without any type of advertising. That’s not the model I want to use here (at least, not initially). Long-term ProBlogger readers will know that my focus of late has moved a little to incorporate monetizing my blogs by developing my own products. I’m not giving the ad game away, but I see growing opportunities in the development of products (so far this has been around ebooks, courses, and membership sites). FeelGooder is a bit of an experiment for me on this front, and I intend to develop a series of FeelGooder products to monetize the site. I’m not completely closed off to the idea of other forms of monetization (including advertising) down the track, but at least initially I’d like to experiment elsewhere. In my experience, monetization comes more easily once you’ve got those other three elements in place. So while I’m certainly thinking about monetization and the possibilities that might emerge there, I’m not currently putting a great deal of energy into that. I hope that sharing some of the backstory behind this project has been of interest to you. Next week I’d like to continue looking at this case study by talking a little about some of the logistical elements of the site, including the design process, some of the thinking behind the editorial strategy, and some of the lessons I’ve learned. I’d also be happy to answer as many other questions as I can about my strategy and the processes I’m going through with FeelGooder. So if you’ve got anything you’d like me to cover, please leave a comment below and I’ll attempt to get through as many of them as I possibly can. Darren Rowse is the founder and editor of ProBlogger Blog Tips - Digital Photography School - TwiTip Twitter Tips - FeelGooder. Learn more about him here and follow him on Twitter at @ProBlogger. Wow, what a interesting topic. It's good to be able to do what you are passionate about. Health, relationships, work finance and social good, I don't think you left anything out. Taking about thinking out side the box. I can wait to see what you come up with and I wish you the best of luck.